Homemade mushroom powders are a great trick to have in your culinary arsenal. They allow you to distribute the flavor of dried mushrooms evenly throughout dishes without introducing the texture and appearance of mushrooms. Mushroom powder also doesn’t have to be rehydrated before use. We’re demonstrating with dried porcini mushrooms, which are an excellent choice for powder because they’re intensely flavorful and one of the few wild varieties safe to eat raw. However, you can use any dried mushroom to make powder, just keep in mind that you’ll want to cook most of them before consuming. 1. 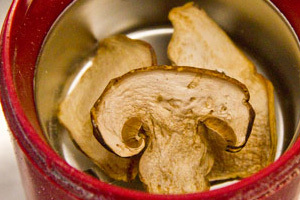 Add dried mushrooms to a coffee grinder or spice grinder. 2. Grind or pulse to your desired consistency. 3. Use immediately or store in an air-tight container. 4. Clean your grinder by grinding plain white rice to a powder, dumping out the powder, and wiping the grinder clean with a dry cloth.